Well into my adulthood, all I knew about prickly pears was that they are the fruit of a cactus, the Sicilians eat them, and that according to Baloo, they are a bear necessity. I’d filed them in the back of my mind to the “someday I’ll get to it” list, along with perfecting bechamel and giving a crap about edible foams. But when I moved to California years ago, I saw them everywhere. Prickly pears are a common landscaping plant, one I’ve taken to growing in my own yard. The fruits, often called tunas, come in all sizes and colors, ranging from teeny to larger than an orange. 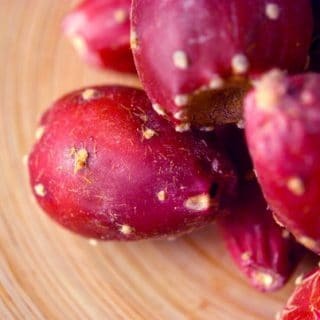 The larger ones are worth eating as a fruit, but the little ones are best for prickly pear syrup, which is what I first made with this fantastic cactus fruit. The first time I brought some home, life intervened and they sat in my fridge in that paper bag for nearly a month. Apparently prickly pears store really well in the fridge. I’ve since kept them in a paper bag in the truck for a week and they were fine. If you want to eat the fruit, you need to get these little flavor grenades out of their spiky skins. Second lesson learned: It’s not the big, seemingly vicious spines you need to worry about. It’s the hairlike “glochids,” which cover the fruit, that you need to worry about. Hated, evil glochids. Even the name sounds like some monster in a George Romero film. Instead of skinning, you can also torch the pears briefly, which burns off the glochids. My friends Elise and Garrett have a method for skinning prickly pears that works well, too. Regardless of how you use your tunas, you need to separate the seeds from the pulp. Garrett and several others say the seeds are edible, but they are either high or have far stronger teeth than I do; it’s like eating a wood chip. The syrup is dead easy. No skinning or burning required. Simply cover the fruits with water, bring to a boil, cover and let steep for 30 minutes or so. Mash with a potato masher, run through a food mill to remove the seeds, and then strain, strain strain. I am something of a fanatic when it comes to clarity; I developed this particular neurosis from making wine. So I pass the pulpy juice through a fine-meshed sieve and then again through cheesecloth or a plain paper towel. After that, I add an equal volume of sugar and bring it to a simmer to thicken a little. Once the sugar was good and dissolved, I turned off the heat and added some citric acid. Why? Third lesson learned: Prickly pears, which taste like a combination of bubble gum, watermelon and strawberries, are mostly lacking in tartness. An exception is the variety the Mexicans call xoconostle. Without tartness, fruit is not very tasty. Why citric acid? I wanted a neutral acid, not lemon juice. They’re close, but not the same. Lemons bring other flavors to the party, and I wanted this to be prickly pear’s show. The result? Pure magenta power. This stuff rocks. The citric acid gives it just the right tang, and it brings out the watermelon-bubblegum elements and holds the color; it’s also a good preservative. My initial use: Mixed with tequila, of course. Cactus and Cactus. Duh! 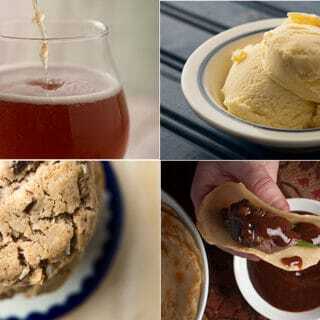 After that obligatory start, you can make sorbet, a vinaigrette for a salad, a souffle, or a glaze for game birds. If you want to do that, here is a glazed pheasant recipe that works just fine with a regular chicken (or quail or grouse), as well as with other glazes such as maple syrup, honey or another fruit syrup. What’s the takeaway? Stretch a bit. Expand your horizons and work with new flavors. Some, like this one, will become new staples for your personal kitchen. 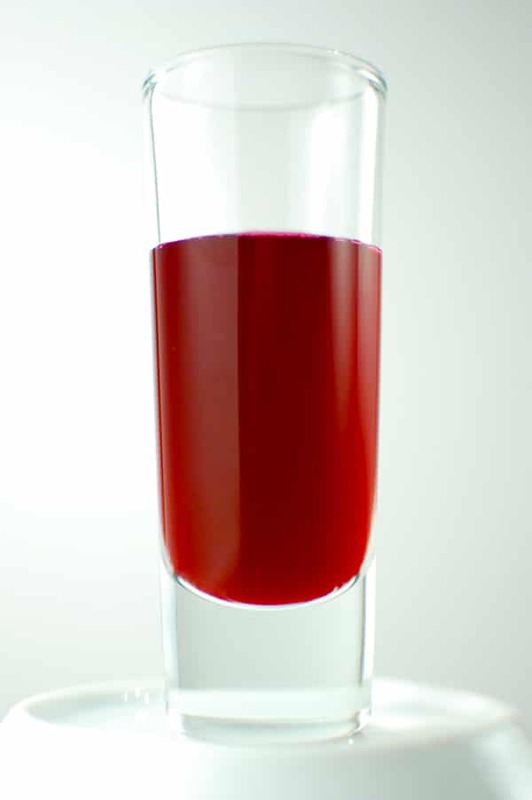 This is a standard syrup recipe, using the brilliant magenta fruits of the prickly pear cactus as the fruit. Commercial versions of this syrup are used for fancy margaritas or are poured over pancakes; two excellent ideas. I strongly advise you to buy citric acid for this recipe. You can often find it in the canning aisle of the supermarket under names like “Fruit Fresh” and the like. 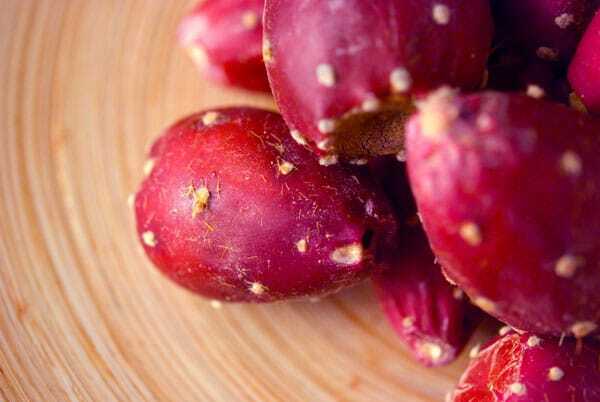 Most prickly pears lack any sort of acid tang and need something to keep them from being insipid. Lemons work fine, but I want base ingredients like a syrup to be pure in flavor. Put the fruits in a pot and add enough water to almost cover them. Cover and bring to a boil. Turn off the heat and let steep for 30 minutes. Mash the fruit with a potato masher, then push it through a food mill to separate out the seeds. Strain the pulpy juice through a fine-meshed strainer, then again through the same strainer that has either cheesecloth or a plain paper towel set inside. You need to do this to be sure of removing every last glochid. Measure the strained juice, and pour it into a pot. Add an equal amount (by volume) of sugar and bring to a simmer over medium heat. Let it simmer for 5 minutes. Turn off the heat and let it cool for 15 minutes. Add the lemon juice or citric acid. Add a little at a time and taste it. Stop adding when it is tart enough for you. Pour while still hot into clean Mason jars and seal. This should keep for months in the fridge, or you could process it in a boiling water bath for 10 minutes and keep it in the pantry; the citric acid helps preserve the syrup. This recipe is a guide: Prickly pears come in all sizes and sweetness levels, so use your taste buds and common sense. My pears were small, mostly about the size of limes. And they were sweet, but not overly so. You’ll find all sorts of recipes using wild fruits here on Hunter Angler Gardener Cook — syrups are just the beginning! Claudia: Maybe? I’ve never tried it. I’m also wondering how the blender would handle the seeds, which are very tough.